Franchise Report for 1893 of The Women’s Christian Temperance Union authored by Kate Sheppard, leader of New Zealand’s suffrage movement in New Zealand. Te Papa. To mark the occasion we have placed Frances Parker’s suffragette medal on display on the Promenade on Level 4 (until 11 December 2016). Te Papa purchased the medal at auction in Scotland in February amidst much fanfare and media interest. The medal itself is surprising small in scale but carries a big story – that of the fight for women’s suffrage in Britain, and the role that New Zealanders played in supporting that fight. Women’s Social and Political Union Medal for Valour awarded to Frances Parker. Made by Toye & Co, 1912. ‘Purple… stands for the royal blood that flows in the veins of every suffragette, the instinct of freedom and dignity… white stands for purity in private and public life… green is the colour of hope and the emblem of spring’. In 1914 Frances Parker wrote an article for Votes for Women under her alias Janet Parker. She wrote it while awaiting trial in Perth Prison for attempting to blow up Robbie Burns’ birth cottage in Alloway. The attempt was part of the WSPU’s attention-grabbing campaign of attacking well known monuments. Her horrifying article demonstrates that there was little dignity, purity or hope awaiting suffragettes in prison, especially if they fell into the hands of a certain Dr Watson. Frances ‘Janet’ Parker’s article in Votes for Women, the WSPU’s newspaper, 1914. Scottish Archives. Dr Watson’s use of rectal feeding sparked a national controversy, and the matter was raised in the House of Commons. Before the issue could be tackled, however, Britain was at war and all suffragette lawbreakers were granted amnesty. Frances Parker, like many of her fellow-suffragettes, channelled her energy into the war effort. ‘If I had thrown a stone as a striker, or even as a man who is intoxicated, I suppose I should have received a very light sentence; for I have noticed that men in Swansea, when they were held up for rioting, got a fortnight’s imprisonment, & the ringleader of them got only six weeks imprisonment. Of course, I admit that the whole difference is the difference of motive, but I think the long sentences in our case prove that the motive is recognised, & I contend that if you recognise the motive you should also recognise the provocation’. While in Holloway Prison a group of suffragettes created this signature handkerchief. Frances’ signature can be found at the bottom of the list on the left hand side, stitched in deep suffragette purple. 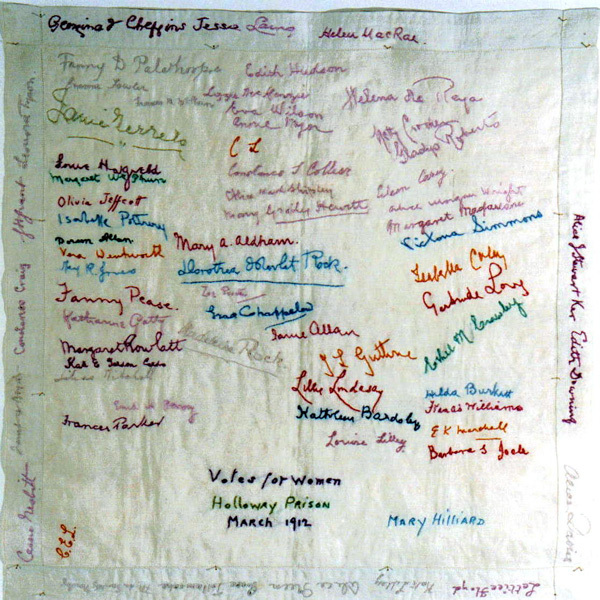 Handkerchief featuring the embroidered signatures of Frances Parker and 65 fellow suffragettes who were held at Holloway Prison, 1912. It is believed that the handkerchief was embroidered during exercise periods. Collection of The Priest House and Sussex Archaeological Society, West Hoathly, West Sussex, England. Denise has alerted us to another cloth that features Frances’ signature. You can read more about her research project on Selvedge magazine’s blog. I am looking forward to seeing the results of Denise’s study and to discovering more traces of Frances Parker’s life and work. In the meantime, ‘Happy Suffrage Day’, and remember to exercise your right to vote in the next few weeks in the local body elections. Polling Booth sign, Gift of Chief Electoral Office, Ministry of Justice, 2007. Te Papa. Fascinating. Is the medal up for a few days? Hi Anne – Good point! Frances Parker’s medal is on display until Sunday 11 December, so you have three months to come and see it!